Cheesecake is one of my favorite things to make, but I hadn’t made one in quite a while. This weekend I put a new twist on my basic cheesecake recipe…and it seems as though the group of people who were my taste testers REALLY enjoyed it. Cheesecake isn’t a bad way to start the week, have a great Monday friends! Preheat oven to 300 degrees F. Combine butter, and cookies; press on bottom of 9-inch springform pan. You might want to put a little cookie sheet in your oven to help catch any drips…even the best springform pans have their mishaps. In large mixing bowl, beat cream cheese until fluffy. Gradually beat in sweetened condensed milk until smooth. Add eggs one at a time; mix well. Mix in vanilla. Over low heat or in the microwave melt caramel and milk. This will give you about 2 1/2 cups of caramel. Pour 1 1/2 cups caramel into cheesecake batter, mixing until completely combined. You can keep the additional 1 cup of caramel in the refrigerator for the topping. Pour into prepared pan. Bake covered with foil for 30 minutes uncover, bake uncovered for 30 minutes or until cake center is set. (This keeps the cheesecake from getting too brown on top…not as important with chocolate cheesecake but still a great little tip). Cool completely. 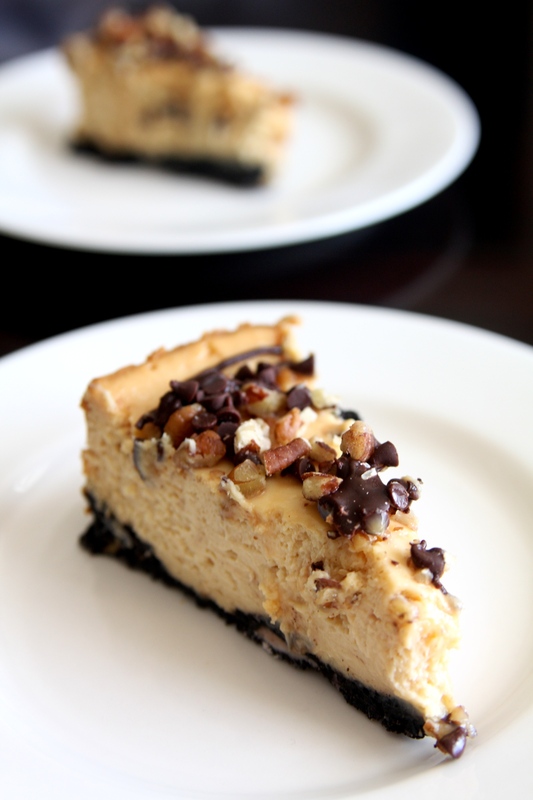 Once cheese cake has cooled completely, top with melted chocolate, pecans, caramel and mini chocolate chips. Refrigerate at least 4 hours before serving. This entry was posted in Cheesecakes. Bookmark the permalink.